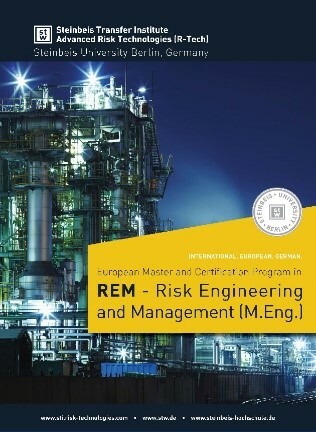 Why to take the Master in Risk Engineering and Management? If you are looking for a program which gives you a competitive advantage in your career by combining theoretical with practical the Master in Risk Engineering and Management at STI R-Tech is the best-fit for you. Risk issues in a modern, fast developing industrial world are main topics of the theoretical part of study while the other half is based on work in real projects within companies. Lecturers are selected from leading experts in corresponding fields. During the project work selected coaches and a supervisor will guide the student in order to correctly transfer methodological knowledge acquired from courses to solve practical challenges in the company. The language of study is English. In terms of curriculum and organization the Project Competence concept goes way beyond conventional degrees. The projects are set to facilitate integrated technology transfer whereby the students gain new skills as a part of their studies and apply their new knowledge in everyday risk issues by supplying deliberate, pertinent and theoretically sound solutions to business problems. The career prospects for graduates from the Master program are wide-scale because there is always need on the market for professionals with technical and managerial skills, combined with past working experience. Upon completion of the program, graduates can start/continue their career as risk managers, -engineers, -inspectors, -legislators, project managers, safety and risk assessors on the fields of industrial engineering, process engineering, etc. Courses are scheduled during the whole year - semesters starting in March and October - and are open to professionals/students coming from all over the world wishing to extend their knowledge and skills. This mixture creates a specific atmosphere and enables students to profit from the international surrounding and open discussions. By enrolling their best employees, companies invest into the future development of their personnel, resulting in innovation of new ideas and finally, success. The program is designed for graduates, interns and young professionals who wish to develop their knowledge, skills and competences in the fields of modeling, formulation, analysis and implementation of simulation for advanced risk problems as well as skills for understanding these approaches in the broader context of engineering science. Students will benefit from a leading group of academics and an exciting international environment. Students may take the Master as a distinctive step in their professional career or in preparation for a Ph.D. degree.